Provides support for critical hormonal production. In one study conducted by D. Jakubowicz and colleagues, 22 men took 300 mg of DHEA nightly for 30 days. They observed an average 27% fall in insulin levels. They also found an 89% increase in IGF-1 (a powerful hormone with multi-faceted effects, most notable its growth hormone-like effects on body composition), a 14% decrease in body fat, and a 7.8% increase in lean body mass. Other discussions at the DHEA conference centered on the Cortisol - DHEA relationship. Cortisol is a catabolic (tissue breakdown) inducing stress hormone. Exercise has been shown to significantly raise serum cortisol levels. These exercise- induced, elevated cortisol levels may contribute profoundly to catabolic effects on muscle tissue. DHEA has been shown to block some acute effects of stress induced cortisol release. Because Mexican Wild Yam contains precursors to DHEA, many unscrupulous companies are trying to masquerade this herb for the real thing. Mexican Wild Yam does not contain any DHEA. Mexican Wild Yam has not been shown in any studies to have the positive effects that real DHEA has. 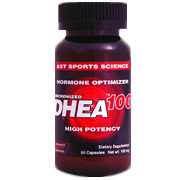 AST Sports Science uses only pharmaceutical quality DHEA. Yet another study revealed that high dose DHEA supplementation decreased body fat levels by 31% while maintaining the same overall body weight in just 28 days. This indicates a significant increase in lean body mass at the expense of body fat. This study shows DHEA may have a profound ability to significantly alter body composition to favor lean mass accrual. Another study showed DHEA had an interesting effect on the choice of foods consumed. A controlled animal study showed those administered with DHEA, when given a choice, chose lean protein and carbohydrate foods as opposed to foods comprised of high fat. AST Sports Science DHEA comes in 50mg and 100mg potencies. What's the relationship between DHEA and Vitamin E? Apart from the well documented effects that vitamin E prevents cellular damage (associated with the aging process) supplementation with vitamin E has recently been shown to protect/ preserve critical DHEA levels in the brain. We know that dehydroepiandrosterone (DHEA) levels within the body protect against an entire range of age-related diseases from cancer to arteriosclerosis. However, DHEA levels within the brain is a known determinant of "brain health" and "brain aging". It is suspected that preserving DHEA levels in the brain may delay the onset of many mental degenerative diseases associated with "getting older". Recently, Japanese researchers performed an elegant study on the effects of vitamin E on brain DHEA levels in rodents and published the results in the Journal of Nutritional Biochemistry (1998;9:339-343). The results showed that a vitamin E deficient diet significantly reduced brain (adrenal) DHEA levels. That in fact, not enough vitamin E in the diet does affect the amount of this vital prohormone in the brain. Also, more importantly, this study showed that supplementation with vitamin E restored normal DHEA levels. However, using more vitamin E did not increase adrenal DHEA levels beyond normal values, so mega dosing vitamin E in this instance is no good. It does appear that the lipid-rich adrenals are very susceptible to damage by free radicals and the accumulation of lipid peroxidation products may decrease the production of DHEA as we age. Therefore getting enough antioxidants may help prevent oxidative damage to the sensitive adrenals and preserve brain DHEA levels. And this may prevent many diseases. When I take your DHEA 100 I get an incredible pump when I lift. I love it. Why does this happen? A lot of people report this and some resent research may point to why this is happening. A resent study out of Japan demonstrates quite clearly that DHEA increases glucose uptake. Increasing muscle glucose uptake while training will noticeably increase the "pump" you feel both during and after training. The study also revealed that DHEA may increase insulin efficiency which would enhance nutrient transport. DHEA 100 is shipped in a discrete, unmarked package. Orders are processed immediately and usually take about 3 to 5 working days to be received. We do ask that you try it for 2 to 3 weeks to feel the full effects. Any information received is used only for order processing and shipping purposes. Your information, such as e-mail address, will never be disclosed to a third party.